As part of Armchair BEA, there are a number of suggested topics for blogging about, one of which is "Ever been to an author signing? Which was your favorite? Share a picture or two, even the picture of your signed book will do. If you haven't ever been to one, tell us all about your dream signing!". This sounds like the perfect opportunity to revisit Paullina Simon's visit to Melbourne 2 and a half years ago. She visited again last year but I wasn't able to attend. I definitely will be trying to again the next time she comes to Australia. You haven't heard of Paullina Simons? She has written a couple of my favourite books mainly The Bronze Horseman trilogy. She regularly tops the charts here in Australia and she often visits Australia to sold out events. It is a mystery to me why she isn't more well known in America in particular. For another fan's take on The Bronze Horseman trilogy, check out this recent post by Katiebabs from Babbling About Books. This is an edited version of a post that first appeared on my blog in November 2007. I have also included a photo of Paullina and me that I didn't post the first time around which was taken at the dinner I mention below. I don't particularly like looking at photos of myself but some times there has to be exceptions I guess. Can't believe how red my face is though. I hadn't had that much to drink! That reminds me. I really need to send the signed copy I got done for me at last year's visit to its planned recipient. First, I will start with how gracious Paullina was when we met her. 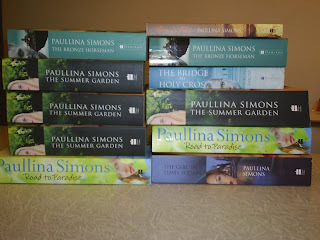 This below is a picture of all the books that Paullina signed for me. Obviously they are not all mine, but I was getting books signed for people who live in a few different countries where her books are not quite so available! On Friday I took a day off work to go and see Paullina. I've never ever been to a book signing before, so I wasn't really all that sure what to expect. She was signing in the city at 12.30pm, so I wandered into the city carrying a pile of books and got to the venue about 12.15. I got in queue, and was only about 10 people from the front, but then I figured that seeing as I wasn't in very much of a hurry that I would wait for some friends from the forum. There was much texting of "how far away are you" but eventually there were three of us there so we took our place in line and waited. It was lucky to have others there that you knew because that definitely made the wait feel shorter. As the line moved more towards the front it was obvious that she was taking time to chat with everyone and not just sign and move on! Now, I am sure that I have mentioned that I mod on her forum, and so spend quite a lot of time there. Mary (I have changed the names to protect the innocent!) was before me, and as the assistant said to are you Mary...THE Mary who posts on the forum?". And then she looked at me and said "And are you Marg?" which really surprised me, but she must have seen photos of us from the get togethers we have had in the past. When she got to me I explained that only one of the books that I had today was for me, but all the others were from other people. When I mentioned who the books that she was signing were for she knew exactly who I meant, and when I gave The Summer Garden to her to sign for one girl, Paullina knew that TSG was her favourite without me saying anything! She was extremely gracious, and said to me that I must be very busy, because she knew that I posted both on the official forum, and at Voy, and also blogged! She was so warm and gracious, and made us feel as though she was as pleased to see us as we were to see her. Then Sue behind me stepped up and Paullina not only took the time to find out who the she was and chat to her, but also to talk to her four year old daughter who had been waiting in line too. After that we said that we were all going to the dinner on Saturday night and we would see her there, and that was it. In the mean time someone else from the forum had turned up, so we waited for her to get through the queue and then went off and had some lunch together. Then on Saturday night, we all gathered again for a dinner. Paullina took the time to come to our table a couple of times, and as soon as she came to the table she knew exactly who she had met previuosly and who she had not, which is pretty amazing when you consider how many people she must have met during the six events she had in Melbourne alone. I sat next to the mother of one of the girls from the forum, and we swapped book recommendations and reading stories, and generally had a really lovely time! It was also really good to catch up again with people who have become friends through the time we have spent together online, and also at the various meet ups we have had over the last couple of years! The previous day when I got home I had gone on the forum and posted something along the lines of it's obvious that Paullina lurks a bit because she knew so much about us, and so I was really quite surprised when at the dinner she said "Now Marg, there is no reason for you to worry about me lurking!" which was a little embarrassing, but in the end it's not that I am worried, it was more that I was so surprised and thrilled! For dinner we had chicken breast stuffed with cheese and pine nuts and something else, on a bed of tomato sauce and served with roasted potatoes, beans, peas and salad, and then sticky date pudding and ice cream for dessert. After dinner, Paullina got up and gave a 30 -40 minute presentation which was very entertaining, and featured some pictures of the places that Paullina went to as she went when she went on a research road trip as part of the writing process for Road to Paradise. She was funny and warm, and had the crowd in the palm of her hands. She certainly made me want to reread RTP now that I had very clear pictures of the journey that she took. A few questions from the audience and then it was time for more book signing. We waited until the very end so that we could have a little more time, take some individual and group photos and have a chat, and it was really lovely. There will be some photos eventually, but of course, my camera batteries died even though I had recharged them the day before and hadn't used my camera at all! Always the way! Not that anyone wants to see photos of me anyway. I most certainly don't! All in all, the last couple of days have been really great. Now that she has moved onto the next section of her tour I hope that the other fans really get to enjoy meeting her as well. That is very cool, Marg! I have The Bronze Horseman on my list at the library, but I didn't realize there were two other books. Authors are very cool people! Love the photo! I blogged earlier this year about meeting Diana Gabaldon, but I also got to meet Sharon Kay Penman, so I think you've just inspired me to write a post about it! That sounds like such a wonderful event, Marg, and Paullina sounds delightful! What a fun experience. What a great experience and she sounds like such a class act! I think it's wonderful when an author shows her appreciation to readers who love her books. Sounds like you had a great time all around! How wonderful :-) What a great chance and congrats for the wonderful experience. What a wonderful experience! I have never been to a signing though. I love authors that take the time to talk to you while you're getting their books signed. For me it makes reading their books that much more enjoyable of an experience! I'm not going to lie. I also have never heard of Paullina Simons. I've heard of Paul Simon, though. ;) I've never had a book signed myself, but can see why so many people get excited after reading about your experience. Wow!! She sounds really lovely!! I'll have to check the books out. It sounds like you had a wonderful time! I do admire people who can keep names and faces straight so easily since it is not something I'm that good at. Sounds like you had a nice time. Thanks for sharing. I love author signings!! I have never heard of this author though, so I should check her out! Afterall, when she signs that many books so willingly, that definitely says something about her character!! It is great when an author singing turns out to be extra special! I talk about one of those moments on my blog today, too. It's cool that she recognized you! What a fantastic opportunity! I love the connection you had with the author and how wonderful she was to you. It's also nice to know authors can be just like the rest of us, lurking and all! :) Great post! This is suhc a wonderful story! Thank you for sharing. YOu are right, I have never heard of this author before. I'll have to check her out. The library just might have her. Thanks Marg.